Natural gas is the ideal fossil fuel to minimize the exhaust-gas emissions of modern dual-fuel diesel engines. Also the costs of maintenance and repair will be reduced considerably. At present, the search for fuels that effect a significant reduction in the pollutant emissions continues. This is due to demands to meet environmental requirements regarding the emission of noxious substances in the exhaust gases of diesel engines. In this process, a very small percentage of between 1 and 10% liquid heavy fuel or diesel oil is injected. During the intake stroke, gas is admitted just before the inlet valves. The liquid fuel ignites the air/gas mixture. The advantage is that the exhaust gases are cleaner than when heavy-fuel oil or diesel oil are combusted. Gaseous fuel contains fewer carbon atoms than a liquid fuel therefore reducing CO2 production. The emission of soot particles and the sulphur content are significantly reduced. Contamination of the engine decreases. to gas below an 80% load. This takes approximately one minute. When there is an interruption in the gas supply, the engine automatically changes over to heavy-fuel oil. The yellow section, the ‘gas valve unit', ensures that gas is safely supplied to the engine under all conditions. A manual shut-off valve, a filter, a pressure-regulating device and two solenoid valves are standard. With engine failure and/or activation of the emergency switch, both solenoid valves quickly close and the engine shuts down. The ‘Engine Control System' controls the solenoid valves that inject the gas in both air ducts before both inlet valves. The liquid heavy-fuel oil system for this dual-fuel diesel engine. 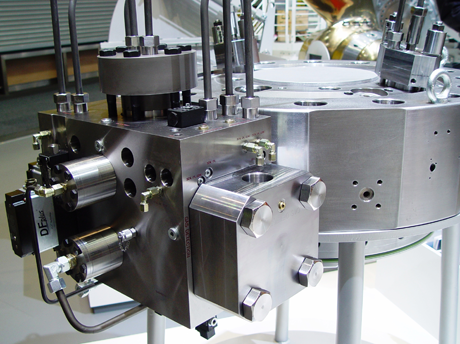 The fuel before the injectors comprises 1% heavy-fuel oil and 99% gas supplied by a ‘Pilot' high-pressure pump unit that via a common-rail system provides the injectors with sufficient fuel. With the transition to 100% heavy-fuel oil use, the large high-pressure fuel pumps provide sufficient fuel. The injectors have two injector nozzles, the pilot and main injector. 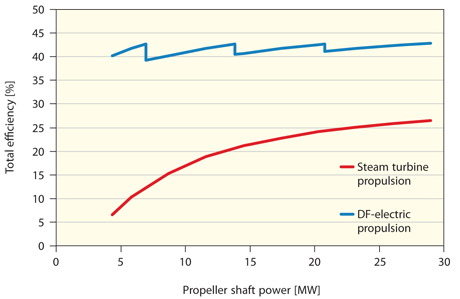 The difference in propulsion efficiency of conventional steam turbines in relation to the dual-fuel systems in diesel engines. For this tanker, dual-fuel diesel engines were chosen which drive electric generators. 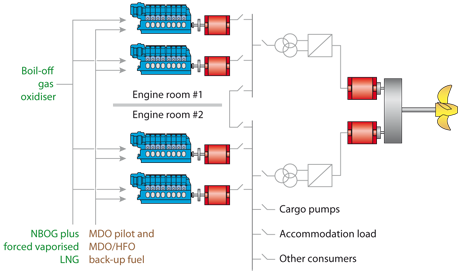 At a reduced speed, one or more gensets can be shut down. Due to this, the propulsion efficiency remains high, also at partial loads. The propulsion efficiency of a steam turbine at full load is significantly lower than that of dual-fuel engines. At partial load, the efficiency drops quickly. An example of dual-fuel propulsion with electro-motors. 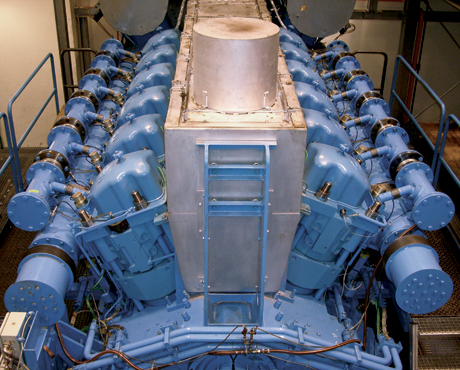 The four DF diesel engines drive generators, which supply the electricity net on board. The electromotors are supplied with energy from this net via a transformer; the speed is controlled by a frequency control. The electromotors are reversible; therefore a fixed-pitch propeller is adequate. The same type of propulsion system of a Wärtsilä design for a very fast roll-on roll-off ferry. Note the second propeller drive. This POD can be operated in any direction for maximum manoeuvrability. The number of orders for diesel engines with natural gas as main fuel and a small amount of liquid fuel as ignition source increases rapidly. Particularly Wärtsilä and MAN Diesel are the leaders in the development of the medium-speed four-stroke trunk piston engines and the low-speed two-stroke crosshead engines with ‘dual-fuel'. Most propulsion ‘dual-fuel' engines are for gas tankers. The cargo, liquid natural gas, LNG, is only liquid at a temperature of minus -160 °C and the ideal fuel for the ‘dual-fuel' engines. Evaporating gas from the cargo will keep the liquid gas on the right low temperature! 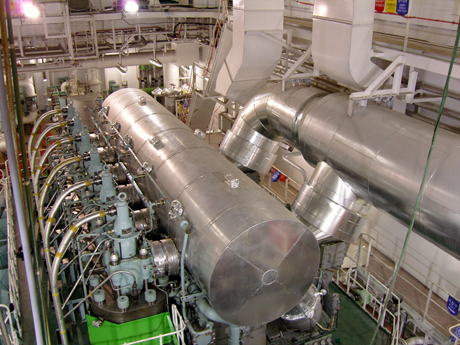 ‘Dual-fuel' engines for power plants are supplied by gas-pipe systems. Worldwide gas-pipe systems increase rapidly, which means that the possibilities for ‘dual-fuel' powerplants also increase. Lower emissions of carbon dioxide, carbon deposits and small particles are the main goals. Smaller storage tanks for liquid fuels, contamination of soil of the environment is also an important issue. In practice the intervals of maintenance of the ‘dual-fuel' engines will decrease with a factor 2-4 compared to diesel engines with heavy-fuel oil. A six cylinder two-stroke low-speed crosshead engine MAN Diesel for the propulsion of a gas tanker. On this engines it is possible to mount a dual-fuel gas system. 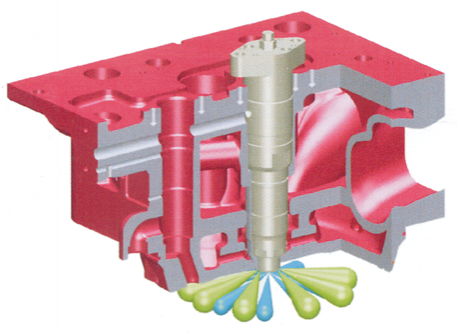 Gas is supplied at very high pressure by a separate pipe to the injector. The dual-fuel module on the edge of the cylinder head of a low-speed two-stroke crosshead engine. A twelve cylinder 32/40 dual-fuel four-stroke medium-speed V-engine, make MAN Diesel. The extra manifold on the left and the right (1) above the intake-air manifold supply the gas to the solenoid valve (2) which admits the gas at the right time near the inlet valves. The dual-fuel engine principle. The diesel process is retained. As the piston moves downwards, a mixture of air and gas is drawn into the cylinder. 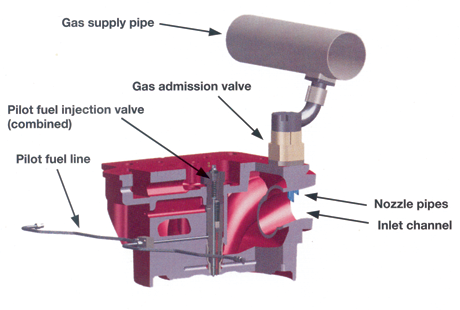 The gas is injected in the inlet channel via a solenoid valve. As the piston moves upwards, the mixture is compressed. The mixture is poor, which means that excess air volume is large (approximately 2). Due to this, the mixture does not ignite spontaneously. Right: just before the top position of the piston, the fuel is injected into the cylinder under high pressure. This ignites immediately causing the air/gas mixture to ignite. Afterwards, the normal process takes place. The one fuel, gas, is admitted just before the inlet valves during the induction stroke. Gas and air are intensively mixed. The air factor is between 1.5 and 2.0. This is known as a ‘poor' mixture. 50 to 100% more air volume is present than required to fully burn all the fuel chemically. At the end of the compression stroke, the very small amount of injected fuel ignites immediately followed by the rapid ignition of the air/gas mixture. The ‘Pilot'-injector replaces the traditional sparkplug. The process continues according to the diesel principle, which has a higher efficiency than the Otto-principle. 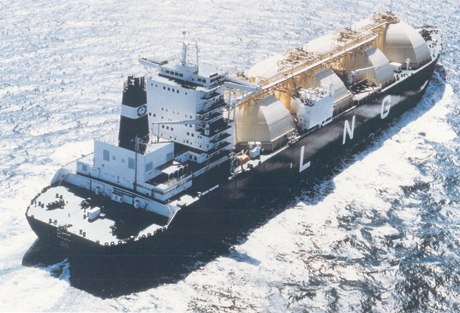 Some LNG-tankers are presently supplied with a propulsion engine that mainly operates on the gas from the cargo. In order to keep the cargo (liquid gas) at a sufficiently low temperature, a very small part of the cargo evaporates. This evaporation requires heat, drawn out of the cargo. This method keeps the liquid gas at the desired low temperature of -180 °C and gaseous fuel becomes available for propulsion. Previously, this gas was also used as fuel for the steam boiler of the steam turbine propulsion installation. The efficiency of such propulsion installations is much lower than that of the dual-fuel engine. Dependent on the distance of the voyage, propulsion uses approximately 10% of the cargo. When a tanker is not carrying cargo, the main engine can run on 100% heavy-fuel oil via the main injector. The separate ‘pilot' injector (nozzle) is then switched off. Until approximately 2004, Liquid Natural Gas (LNG) tankers were propelled by steam consisting of a high-pressure water-tube boiler, a steam turbine and a condenser unit. The fuel is supplied from tanks in which the liquid gas is kept at a temperature of -180 °C. The evaporating liquid fuel is constantly boiling during the voyage and therefore removing the heat from the LNG tanks, keeping the LNG at a constant low temperature. Per voyage, dependent on the time taken, between 2 and 10% of the cargo is ‘boiled off'. The steam boiler can be fired with heavy-fuel oil when failures occur. At present, the orders for dual-fuel engines continue to experience tremendous growth. All the LNG-tankers ordered in 2006 were supplied with these engines. This is similar to the Dual-Fuel principle: the supply of modest amounts of liquid fuel, often less than 1% of the fuel consumption at full load and a substantial amount of gaseous fuel. During the intake stroke, only air is drawn in and compressed. 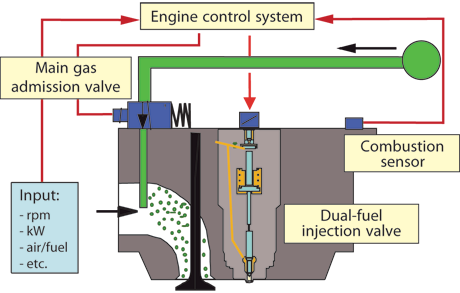 Just before the TDC position, a small amount of liquid fuel is injected, immediately followed by the injection of the gaseous fuel. If no gaseous fuel is present, the engine can run on liquid fuel. A disadvantage of this gas/diesel system in relation to the dual-fuel system is that the gas must be compressed to a very high pressure, approximately 350 bar, so it can be injected at the end of the compression stroke. This requires a considerable amount of power for gas compression. The gas-diesel (GD) engine principle. 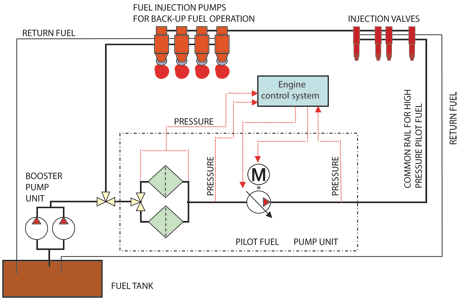 The gas-diesel (GD) engine operating principle. 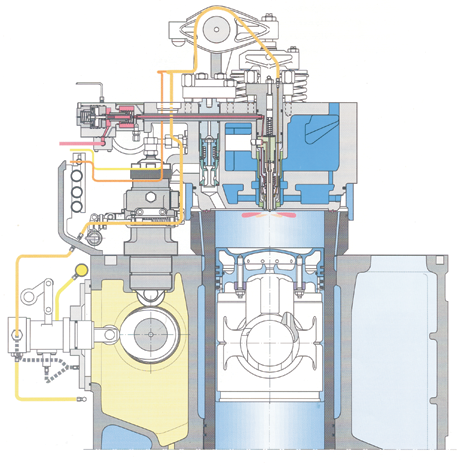 A cross-section of a Wärtsilä 32 GD engine. In principle, gas-diesel engines are built in the same manner as diesel engines, only the fuel systems differ. Note the horizontally positioned pilot-fuel pump on the side of the camshaft. Above left; the (red) gas supply is shown. The heavy-fuel oil pump, above right of the camshaft, circulates the fuel without the main injector being activated. 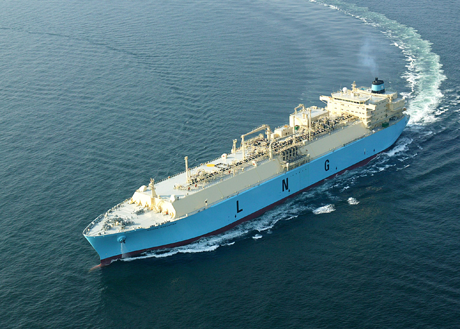 The gas tanker ‘Ras Laffan', a new generation of gas tankers with a capacity of 260,000 cubic metres. Owner Qatar Gas Transport Company. 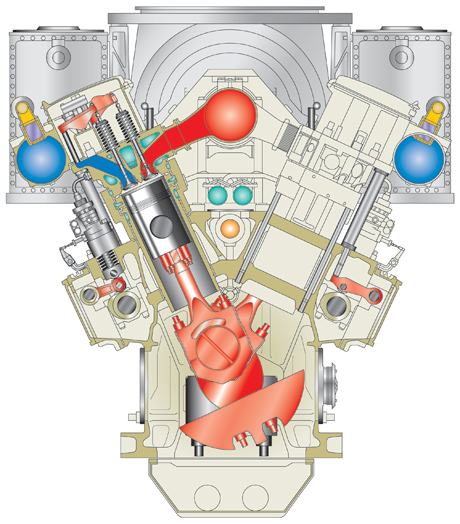 A cross section of a medium-speed four-stroke V-engine, make MAN Diesel, type V 51/60 DF. Left the yellow gas supply pipe above the air-intake manifold.